Reliable touch-free hand soap dispenser. Large sight window makes it easy to check refill level. 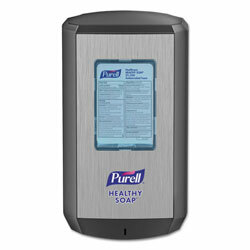 Uses PURELL® CS6 1200 ml HEALTHY SOAP® refills. Dispenser and formulation are calibrated to provide the optimal dose for effective hand hygiene. Includes four "C" cell batteries - no tools required for replacing batteries. LOCK OR NOT™ technology can convert to a locking system. Dispenser Type: For Foam; Capacity (Volume): 1200 mL; Holds: 1200 mL; Color(s): Graphite. Soap Dispensers from Purell! 98 In Stock today.